After a lot of frustrated blowing, Gabe can whistle. He produces almost constant high-pitched sound. When not whistling, he sings and warbles in an alto pitch to himself and in answer to questions. Half-term and the children spent a morning at a friend’s house. Gabe and Eliza played with their opposite numbers – B & A. Robin didn’t have a contemporary to play with and so their hosts’ grandmother sought to entertain him. “What do you like doing most of all?” she asked him. “Hugging and kissing mummy and daddy”, he answered. This reminded me of the answer he gave me on holiday last summer when I asked each of the children what they would most like to do on our last day in Norfolk. Visit the swimming pool was choice of Gabe and Eliza. ‘Fight Daddy’ was top of Robin’s list. With a half-term trip to Nan and Grandad’s came two long car trips. In the car, but also in the bath, at meal-times, walking down the road, Eliza likes to play word games: I Spy, Who am I animal/person, True or False, Keep your enemies close, etc. She likes a high turnover of turns, facilitated by clues given after a couple of blind guesses. Eliza lost her first tooth, quickly followed by a second. She placed each tooth under her pillow to exchange it with a currency gift from the Tooth Fairy. The morning after losing her first tooth, Eliza found me in the bathroom. She was holding a pound coin. ‘I have a one….’ she said, not knowing what it was called. What really excited her was that she thought she read her name on the coin where the monarch’s name is engraved. Gabe went to Sale Cricket Club under 9 practice for the first time. There were 9 other boys, mostly bigger and probably a little older than he. The session was run by Rick, who had given Gabe some coaching in the autumn. They began with a game that crossed netball with cricket. Gabe stayed mostly on the margins, but his confidence grew. The second half of the session was a cricket match where each batter faced one ball at a time. Gabe scored some runs and played some nice front-foot shots. In the field, he came close to the catch of the day. He has said he enjoyed the session and can’t wait for next Sunday. An enduring peculiarity of Robin’s speech is his fondness for the word ‘take’. It replaces ‘put’, ‘switch’ and other action verbs. So he ‘takes’ his shoes on, lights off and TV on. Gabe had asked L about Bloody Mary and been told of Queen Mary’s vengeance against Protestants. Eliza overheard and squealed. Gabe related a playground tale that if you look into a mirror and say ‘Bloody Mary’ three times, she will leap out of the glass and kill you. Eliza sobbed, terrified. Her fear recurred at bedtime for the next two nights. Her wailing intensified if L or I offered to show her that the tale was nonsense. Only quiet, diversive talk calmed her for sleep. It is very rare for the question, ‘How was school today?’ to receive an enthusiastic positive response. The visit to school of the Zulu Nation dance troupe achieved it. Gabe showed me the dances and raved about the day – which had only left time for 1 and 1/2 lessons. Robin took possession of a third light sabre. A pound shop triumph that lit up and emitted sounds of a sword being drawn from a scabbard and two sabres clashing. Robin played with the sabre continously taking it to bed with him, where the ‘ksshhh-ung’ could be heard after his light went out and then again before it was time to get up for breakfast. By tea time on day two the sound and light show had been exhausted. 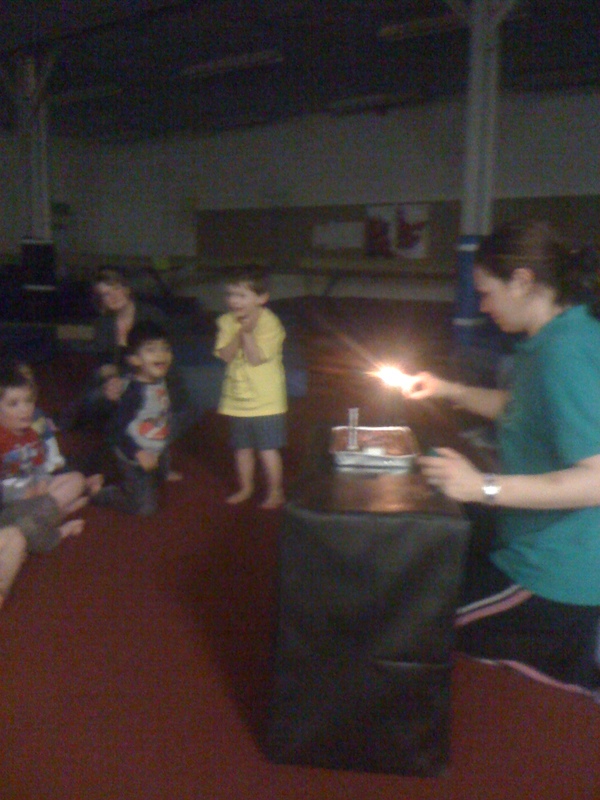 Robin’s fourth birthday party was at the gym. Ten friends came and one or two were always pursuing him as he belted around the gym, on and off the apparatus. It was a very good natured event for a fourth birthday party. Robin saved his best for the lighting of the cake. As the candles and indoor firework were lit, Robin hammed up a look of shock, seeming to enjoy having everyone’s eyes on him. As a two or three year old, Eliza had declared that she loved ice cream more than Daddy. She has since rowed back from this extreme position of confectionary-philia. It was tested again yesterday, when a lengthy meal with friends in London was cut short to dash to the train back to Manchester. Despite nagging the waitress, the ice cream arrived as we were saying goodbye. Eliza had time for one mouthful. She was rewarded for her quiet endurance of this disappointment with an ice cream special for tea today. Gabe stayed up late at our hosts in London on Saturday, so he could see our friends who were coming to dinner: B & V and M & S. Gabe talked to B about football, MatchAttax, cricket and singing in Liverpool. When M arrived, he got to talk again about the trip next month to Liverpool. M delighted him by suggesting that he may be able to come and visit us at the time of the concert.